Sometimes you just want simple comfort food. Sometimes you just want to sneak veggies into unsuspecting family members. Well, why not both? YoungerSon did pick out all the tiny pieces of red pepper and zucchini. But theHubby ate his meatloaf all gone, INCLUDING said red pepper and zucchini! And he normally HATES red pepper and zucchini! So there is something to be said about this recipe. The original recipe included green pepper along with the red pepper. But even I don't like green pepper except in salads, so it was omitted. You can add a 1/2 green pepper if you like. I certainly won't stop you. YoungerSon is home sick with a cold that has degenerated into sinus and ear infections. He caught the cold from me, who had caught it from olderSon when he came home from college for a couple of days. OlderSon had an ear infection as well (olderChild used to call them "ear confections" when she was little, but I digress ...). Somehow, infections that require antibiotics managed to skip me, but I was flopped on the couch for several days while the progeny were able to function somewhat. I'm not sure who had the better deal. So what does all this have to do with food? 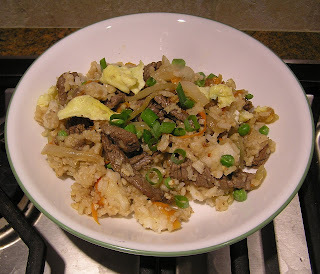 There I was, staring at a steak in the fridge, hoping it would speak and tell me what I should do with it this evening (as usual, the steak wasn't very communicative) when youngerSon strolled by and croakingly suggested, "steak fried rice." So after dragging myself off to a grueling day at work (yes, kiddies, Happy September! The library is back to its Sunday hours), I wanted nothing better than to make something relatively easy after working FIVE WHOLE HOURS. Of course, there, staring back at me in the fridge, was a partially defrosted bag o'wings. Technically, just the halves of wings that look like mini-drumsticks. But still wings. 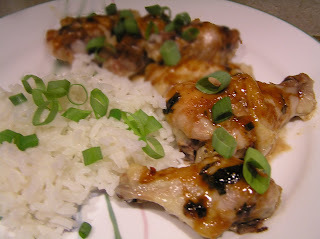 I've been tinkering with a recipe for the past year, adding and dropping ingredients in an effort to find The Perfect Wings recipe. Haven't found it yet. But if you don't count snipping up cilantro, the version I have at the moment satisfies everything I want in a weekday-on-the-weekend meal: easy.